The scientists who cloned Dolly, the first mammal ever cloned from a single adult cell (see Hello Dolly, have discovered evidence that she is aging prematurely. They say that because Dolly, now three years old, was cloned from a six-year-old adult sheep, her cells show signs of what could be advanced aging at a genetic level. As creatures age, the tips of their chromosomes fray and shorten progressively (see The countdown to death). It appears that Dolly has inherited the ‘pre-aged’ genetic material of the adult from which she was cloned. The discovery has heightened the concerns of many scientists about the risks involved in the pursuit of human cloning. Nature, May 27, 1999, pp. 316–317. New Scientist, May 29, 1999, p. 12. Further to the above, in January 2002, Dolly was diagnosed with arthritis, normally found in old sheep. And on 14 February, she was put down at the age of 6 because she was suffering from progressive lung disease, again something common in older sheep. Sheep normally live to 11 or 12 years, but Dolly’s premature death makes sense in the light of the above, since she was cloned from a cell of a six-year-old ewe. Scientists have found that mammals, including humans, have two navigation aids in their brains like a tiny compass and map, giving them an inbuilt sense of direction —even in the dark. The researchers began by blindfolding volunteers strapped to a chair, spinning them round and then asking them to stop the chair when they thought they were facing their original direction. They consistently stopped at the right place, or close to it. Further research recording brain electronic activity revealed the presence of specialist ‘place cells’ that each record an image or object in a positional setting to create the equivalent of a mental map. The discovery of these place cells helps to explain why, when we get up in the night, we can find our way around without turning the light on — and without tripping up. New Scientist, January 23, 1999, pp. 24–28. We are indeed ‘fearfully and wonderfully made’ (Psalm 139:14). A titanic flash of high-energy radiation — ‘the most violent event ever observed in the universe’ — has baffled astronomers. Even though the object was nine billion light years away, its extraordinary brightness was such that it would have been visible to anyone using ordinary binoculars who had been looking in that direction. The gamma ray burst (which also produced visible light and radio waves) was detected on 23 January 1999 by a satellite and also witnessed at an observatory. Astronomers said that if the energy of the burst went out equally in all directions, it defies explanation. The total amount emitted then would amount to the conversion into energy of two objects the size of our sun — much more than could be provided by the favoured models for gamma ray bursts, which include the collapse of a massive rotating star, or the coalescence of two neutron stars or black holes. Science, March 26, 1999, pp. 2003–2004, 2069–2072. 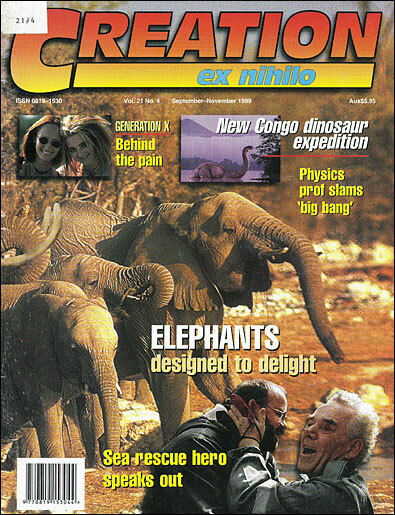 Nature, April 1, 1999, pp. 368–369, 400–402. Humans, rather than climate change, may have driven the Australian ‘giant emu’ Genyornis to extinction. More than 40 Australian animals, including other giant ‘megafauna’, vanished at roughly the same time. The theory that people caused their extinction has received a boost from dating of Genyornis eggshell fragments. Science, January 8, 1999, pp. 205–208. Evolutionists believe that the first people came to Australia 50,000 years ago. There is, however, evidence consistent with a much more recent arrival, within the post-Babel time frame (Creation 15(3): 48–50, 1993). Aborigines have clear stories, unlikely to survive oral transmission for tens of thousands of years, of birds towering above men (Creation 19(1)50–51, 1996). For years evolutionists have tried to blur the differences between chimpanzees and humans, stressing that chimp DNA is ‘98–99% the same as ours’, and that they are therefore almost human. Creationists have pointed out that the percentage figures are rubbery, that even a 1.5% difference still represents huge amounts of information (something like 150 large books), and that some genes are more crucial than others, acting as ‘switches’ (Creation 19(1):21–22, 1996). We have also pointed out the huge differences between chimps and us. Also, human genes are arranged differently — compared to chimps, chunks of DNA, sometimes huge, are ‘reversed’ on five of the chromosome pairs. Molecular biologist Walter Messier says, ‘Not that chimps are stupid, by any means. But we’re the ones that put them in cages, not the other way around.’ It is becoming more respectable for evolutionists to admit (without abandoning belief in evolution) that ‘we are not simply deluxe chimps’. New Scientist, May 15, 1999, pp. 26–30. ‘Towering’ dinosaurs... a tall story? New computer software shows that traditional images of the huge long-necked dinosaurs such as Diplodocus could be wrong. The largest land animals that ever lived have usually been depicted with their necks pointing skywards as they munched away on trees. Fossil experts have assumed that they took advantage of their size — some were over 100 feet (30 metres) long — to reach food in trees inaccessible to others. However, the computer modelling of how the bones in the spine moved has shown that Diplodocus usually adopted a ‘head-down’ position, similar to cattle when grazing. It was probably unable to lift its head much higher than its back, with the most relaxed neck posture being nearly straight or with a slight downward angle. Science, April 30, 1999, pp. 798–800. America’s NBC network has series, filmed in Australia and starring Jon Voight, which makes a mockery of the Genesis account of Noah and the Flood. The series puts the destruction of Sodom and Gomorrah before the Flood, and makes Lot out to be Noah’s best friend. Noah’s sons have their ‘girlfriends’ along for the ride. A band of marauding pirates and a peddler selling hats also survive the Flood. WORLD Magazine, May 15, 1999 [from <www.worldmag.com/world/issue/05-15-99/opening_3.asp>]. The Cincinnati Enquirer, June 3, 1999, p. 12. Science, June 11, 1999, p. 1748. Apart from the well-known explosions called supernovas, normal theories have processes in stars happening over millions of years. This may be a timely reminder that ‘it ain’t necessarily so’. The Weekend Australian, March 20–21, 1999, Review 13. One of the biggest studies to date investigating whether there is a genetic cause of homosexuality has failed to find any evidence for the existence of a so-called ‘gay gene’. The research team, led by Dr George Rice of Canada’s University of Western Ontario, initiated the study. It followed the earlier sensational claims of self-confessed homosexual Dr Dean Hamer and his team in 1993 purporting to have found a genetic link to homosexuality. Several years of frenzied research aimed at isolating the ‘homosexual gene’ proved fruitless. Now Dr Rice’s team, using a much larger study sample and sophisticated genetic tests, has found no evidence at all of any link between this marker and sexual orientation. The Independent, (U.K.), April 23, 1999, p. 5. Science, April 23, 1999, pp. 571, 665–667. ‘It was always a meek and gentle creature, but now it has turned into a monster. My two daughters, aged two and five, used to play with it. Now they are scared to go near it for fear it will gobble them up too,’ Marzouqi said. CNN Custom News, June 3, 1999. Accounts such as this of herbivores (plant-eaters) killing animals and eating meat are not uncommon. They may give us insight into the entry of carnivory (meat-eating) into the world after the Fall. Conversely, many carnivores can be trained to be vegetarian. Researchers have tried to measure how many damaging mutations (inherited copying mistakes) appear in the genes of each new generation of humans. However, they began by assuming that current theories of molecular evolution are true. On this basis, they compared human DNA with that of gorillas and chimpanzees. From this, they calculated conservatively that harmful mutations occur at a rate of 1.6 mutations per person per generation. This staggeringly high value has shocked and baffled evolutionists, because it means that theoretically humans should have become extinct by now! Nature, January 28, 1999, pp. 293–294, 344–347. There would seem to be only two logical conclusions: either people haven’t been around for very long, or the evolutionary assumptions on which the estimate is based are wrong. We’re happy to agree on both counts. World-wide research in DNA sequencing (‘mapping the genes’) continues to produce reports of the ‘traditional evolutionary’ view of various species being thrown into turmoil [see e.g. ‘Sharks and camels … cousins?’ Creation 21(1):7, 1998]. A recent comparative analysis of turtle DNA has rocked evolutionary theory because it shows turtles to be more ‘advanced’ [according to evolutionary thinking] than previously thought, in direct conflict with traditional paleontological [fossil-based] assumptions that turtles are ‘primitive’. Science, February 12, 1999, pp. 945–946, 998–1001.